Ships from and sold by Colorful Mart Australia. We compress this item when packing, so it needs 2~3 days to restore the normal thickness after you open the package. This flannel futon mattress is soft, comfortable, and breathable. It's able to be rolled up to keep in closet and rolled out right on the floor to sleep on. It makes for an efficient use of living space and storage, easily to move. 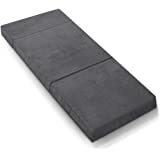 This 2" thickness tatami mat is perfect to sleep on floor. 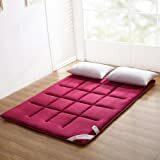 Moreover, it can be used in multi purposes such as picnics, visitors, children playing games, taking a rest, massage, yoga, exercise.... You can use this sleeping pad in any efficient places, such as guest room, living room, exercise room, patio, studio, dormitory, mobile house, massage studios and also bring it with you in your car when going to anywhere. Rotate your futon mattress regularly will keep it from developing sink spots and give it a longer life. When you first purchase your futon, rotate the mattress on a regular basis during the first 30 days to ensure optimal weight distribution. Use a damp washcloth, warm water, and mild laundry detergent to remove any unsightly surface stains. Avoid soaking the mattress; too much moisture can lead to mildew. 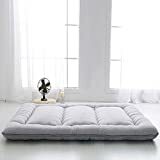 Unfold the futon so the mattress is flat and sprinkle baking soda over the mattress. Let it sit for about an hour while the baking soda absorbs odors, then vacuum it off. For a deeper cleaning, you may be able to use a steam cleaner to deodorize your futon. Leave your futon unfolded without a cover or any bedding for an hour or so. This will give the mattress time to air out. You can also use a fan to help circulate the air while you're airing it out. Vacuuming your mattress on a regular basis throughout the month will help keep it free of dust and dust mites. If you leave it folded up in the sitting position while you vacuum, make sure to get in the cracks with the brush attachment. I was looking forward to being able to write this review... I received my item. I ordered a GREY/FULL. The delivery time was as stated. I read ALL the reviews prior to ordering, compared to similar products and took my time before ordering. My reasons for choosing: COLOR. MEASUREMENTS. 3lb WEIGHT. ABILITY TO ROLL UP. 1-2 IN” THICKNESS. INVESTMENT (price). Yes it’s thin and should not be a purchase for those seeking a “mattress like” cushion. Customarily we sleep on futons. I AGREE with other reviews and this item should NOT be the reason you’re choosing it. It’s NOT of the same caliber and the connotations in its descriptions CAN be misleading. I have an 18lb goose down mattress topper. I’ve purchased a no spring mattress in a box, so I WAS LOOKING FOR SOMETHING LIGHT & SIMPLE. 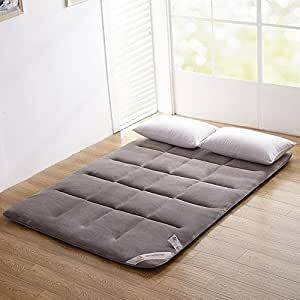 My intentions is to also be able to travel with it without being big bulky, but I didn’t want a sleeping bag or camping cot cushion. It comes with a tote, which is a PLUS PLUS for me. I’m use to Queen measurements & the FULL did seem tiny - yet matched the descriptive size. As far as the price, well... I wouldn’t say it’s a $70-$80 item. $50-$55/absolutely! Especially since a single towel or pillow case can range around $15 each. Memory foam, NO! If that’s the word manufacturers are using to say it won’t deflate easily, lose its shape or flatten instantly, then I’d have to argue my point as Robert DeNiro did in Casino by insisting all the muffins have the exact same amount of blueberries. The manufactures photo resembles a large/fluffy item. This must be an Alice in Wonderland size room. I would compare it more to a car seat pad. PAD, NOT CUSHION. For me, this item is exactly what I need. Once you start sleeping on the floor your brain within 2 or 3 days accepts that it's the way of the future. It makes your back feel good, saves space, and you can sleep just as comfortably if not more comfortably than before. Unfortunately, its always weird having to tell a girl that you sleep on the floor. Oh well, at least now your home studio has more space for rappersto feel comfortable in. 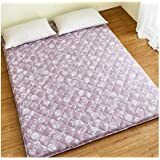 I would not sleep on this on the floor; as others have stated a comforter on the floor would be about the same level of comfort as this. I chose to use this as a topper on my LoveSac "sactional" couch. (Google LoveSac to get a full understanding of this review--and maybe invest in an amazing product!) We have five bases and five sides/backs. When I configure the bases length wise two wide and two long with two backs as a headboard, I have a full size bed. The problem is: Then I have cracks where the cushions meet and butts tend to get stuck and uncomfortable when laying down for sleep. This topper covers the full size configuration of my LoveSac "sactional" with a little room to spare on the foot. Final thought: I would use the queen topper on a full size mattress or on a LoveSac. 4.0 out of 5 starsGreat for taking naps with my dog! For super padding, I fold my king size into thirds accordion style, to provide the padding I need for myself. So if you are a single, buying a KING and folding in half or 3rds doubles or triples the padding. I had tried a thicker, (too firm for me) https://smile.amazon.com/gp/product/B00CL9900E/ref=oh_aui_detailpage_o05_s00?ie=UTF8&psc=1 and also a kids https://smile.amazon.com/gp/product/B074Q2T1KJ/ref=oh_aui_detailpage_o08_s00?ie=UTF8&psc=1 . This Japanese Floor Futon works best.